Jacob’s family first heard about camp when Sandy, the sister of Barnabas founder Cyndy Teas, mentioned Barnabas to them at a 4th of July parade. They knew they had to try it out! Both Jacob and his sister decided to come and never looked back. Eight years later, Jacob keeps coming back for more and we couldn’t be happier! Jacob at camper arrival with his sister and 2018 counselor. 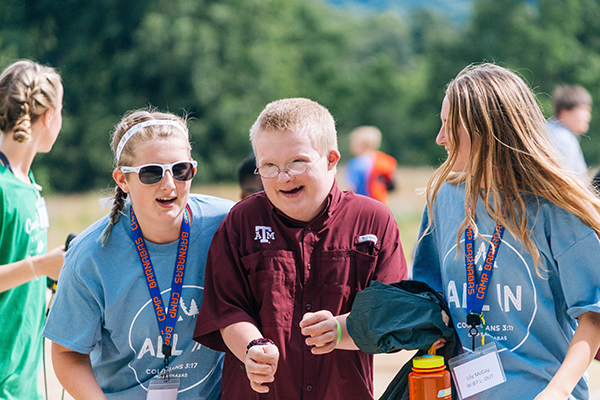 Question: What is your favorite part of camp? Answer: Pool party. I love how the staff loves me and teaches me more about Jesus. 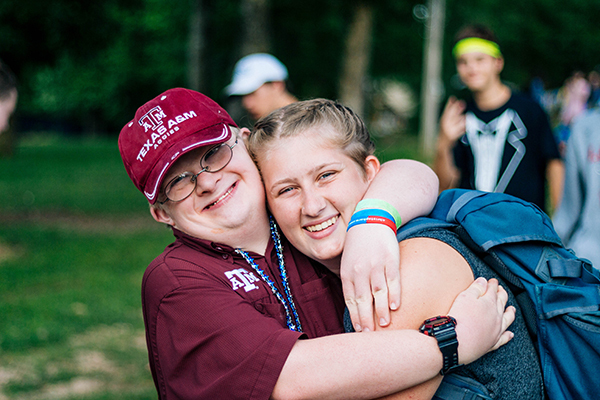 Question: Why do you keep coming back to camp? Answer: To make new friends with the great counselors. 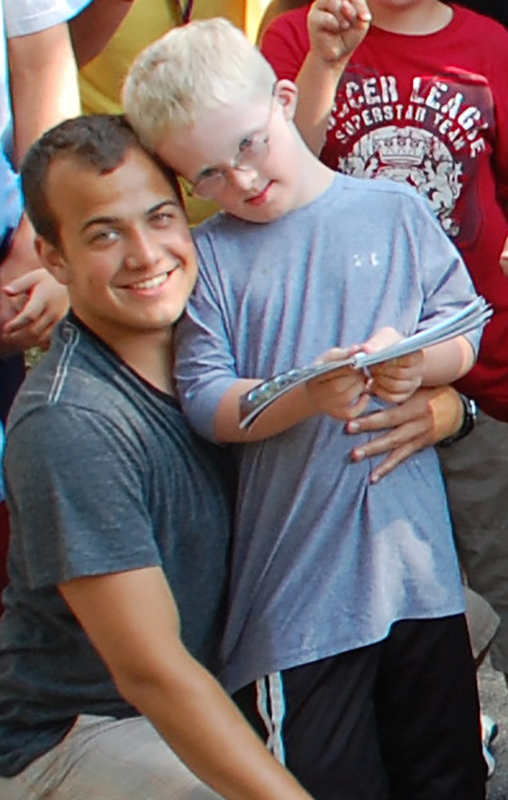 Jacob with his counselor in 2012. Question: What is your favorite meal at camp? Jacob enjoying skit closet activity in 2017. Answer: I love going to high school at Highland Park. I can’t wait to get there every day. On Tuesdays, I go with my grandmother to Starbucks and I get a tall Pike Place. I like my coffee black. Then I go to Howdy Homemade for ice cream-cookie monster–my favorite flavor. 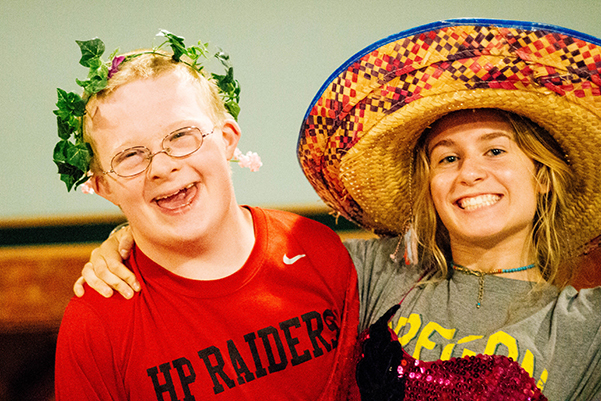 Thursday night I have Capernaum Young Life. I love my church family on Sunday mornings and evenings at King of Glory Lutheran Church. Sunday nights at our church’s disability-friendly service (Joyful Spirit) I play my drum with enthusiasm! I’m often in the stands cheering for many sports teams for Highland Park; I was named “Fan of the Year” for the varsity girls team! 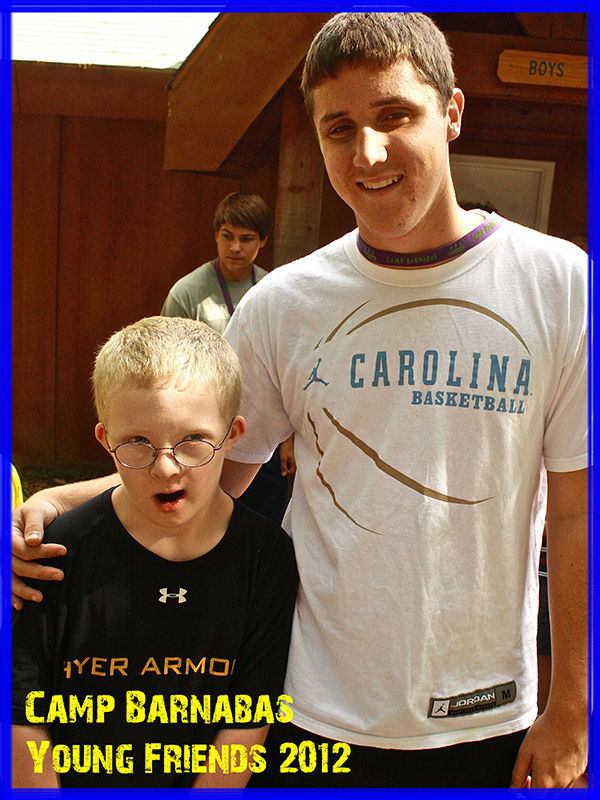 Jacob with his counselor in Summer 2010. Question: What do you love to do when you’re not at camp? Answer: I love to go places and be with people, call my family and friends–I love Facetime. I’m always curious about everyone’s day. Answer: I want to work at Starbucks, El Fenix, and Camp Barnabas! 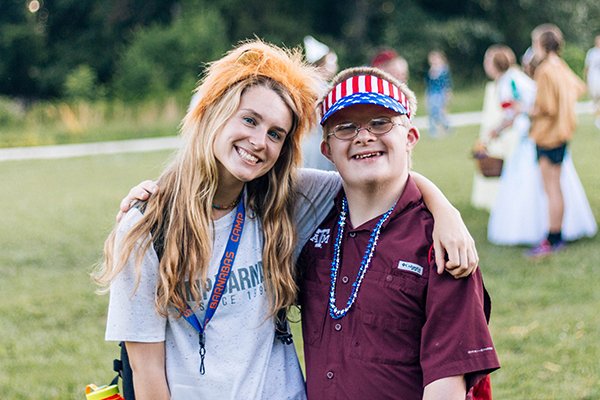 Jacob enjoying the party at camp with his counselor.